Hockey may be officially Pakistan’s National Sport, but virtually griping is the national (spoil) sport. 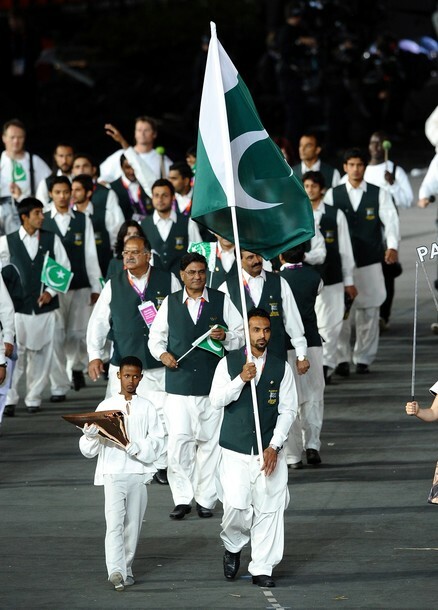 As the Athletes Parade commenced during the Opening Ceremony of the 2012 Summer Olympics in London, the arrival of the clad-in-green-and-white shalwar kameez Pakistani Contingent evoked more complains than cheers and excitement back home. The grumbling was weaved around the expressions of the athletes, which were apparently dispirited. ‘Sohail Abbas looked dead straight ahead like he was going to the gallows instead of representing Pakistan as its flag-bearer. So engrossed was one woman with her dupatta that she refused to look up once. One athlete with greasy shoulder-length hair seemed to give angry little stares at everyone. Only one player gave a little wave. But not one of those athletes cracked a smile! Every other country’s team seemed to be enjoying the spotlight. The American contingent came out pumping their fists chanting USA! USA! China’s own sea of athletes looked cheerful. For goodness sake, the Greeks came in grinning and waving with their country in economic turmoil that may take Europe with it. Syria is going through a civil war, but their team looked so exceedingly jolly, it was worrying. There is a possibility that Sohail’s walk contained an abundance of nervousness or over-cautiousness to avoid a misstep under the banner of a state that is already under the global glare, but it is most fitting to beckon attention towards the multiple instances of many flag-bearers not marching and grinning, but firmly carrying the flags while wearing an equally firm, dignified expression on their faces. In all the carping, the occurrence of Sohail Abbas, the man with the most goals in the history of field hockey to his name, being the image of Pakistan’s delegation was pressed below into lesser importance. Pakistan’s Contingent enters at 1:03:13 and lest there are still some who fail to spot the smiles amongst the athletes, then let them book themselves a much-needed visit to the optician. And the woman who was ‘so engrossed with her duppatta’ not only looked up but was captured during it with a lovely, broad smile that lit her face aglow. ‘One athlete with greasy shoulder-length hair?‘ Oops! He forgot to conduct a national poll on how he should style his hair before going to the Olympics. It would’ve taken less than a second to search for the name of this ‘athlete with greasy shoulder-length hair ‘ than creating and conferring this description on him with a derogatory bent. His name is Shakeel Abbasi. Probably, the author is unaware, or has hardly followed hockey but this ‘greasy-haired’ player is terribly talented sportsman with brilliant performances. Too bad though, that his hair doesn’t fit people’s expectations and definitions of style and ‘class’. Meiryum Ali mentioned some countries with political, social and economic problems similar to Pakistan‘s, but what she failed to realize was how separate countries have one or two of those issues respectively; no country has had the misfortune of being the convergence tip of all those difficulties at the same time, like Pakistan and this does act as pressure for all Pakistanis on the international stage. Try becoming good enough to be a part of or leading the Pakistani contingent at a globally-famed event, and at a knot in the country’s journey where its possibly the most looked-down upon in the world. Add to that, recent visa scandals, controversies and management failures. On a related note, caustic censures on the athletes also seem to have been sparked by their inability to bag any medal in the Olympics (the hope’s hooked on the Hockey Team now) but to be fair again, one who is oblivious to the state of sports training, equipment, facilities, finance, lack of merit and sponsorship and the miserable condition of the massively politicized, feckless and incapable sport boards that are under government-patronship; should really put a lid on the overflowing drains of misguided criticism. Give the athletes and this inherent habit of bitter drivel a break. * Later posted on Ideas Evolved.